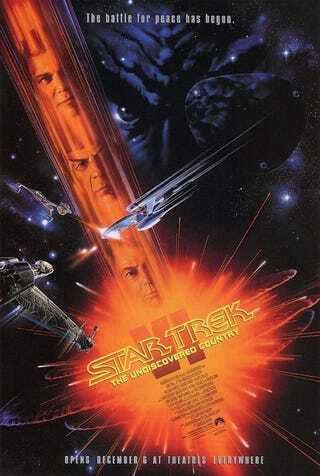 At the Hero Complex Film Festival, director Nicholas Meyer revealed a confrontation he'd had with Gene Roddenberry over Star Trek VI: The Undiscovered Country. If I'm interpreting him correctly and if I'm believing what he said, Mr. Roddenberry really believed in the perfectability of man, of humans, and I have yet to see the evidence for this. So VI is a film in which the crew of the Enterprise has all kinds of prejudice, racial prejudice, vis-a-vis the Klingons. And some of their remarks, including how they all look alike and what they smell like, and all the xenophobic things which we grappled with - that was all deeply offensive to him because he thought there isn't going to be that. In fact, in his original Star Trek concept, there wasn't any conflict. His guys were lined up on one side of the room, and my guys were lined up on the other side of the room, and this was not a meeting in which I felt I'd behaved very well, very diplomatically. I came out of it feeling not very good, and I've not felt good about it ever since. He was not well, and maybe there were more tactful ways of dealing with it, because at the end of the day, I was going to go out and make the movie. I didn't have to take him on. Not my finest hour. There's more from Meyer at the Los Angeles' Times' Hero Complex, including his impressions of the actors during The Wrath of Khan.